There's nothing more disenchanting than feeling genuinely 'blah' about your outfit, especially when you're a busy gal with places to be, faces to see, and no time for multiple daily wardrobe changes (we feel you). Thankfully, it's no longer impossible to find an outfit that is perfectly tailored for dance class and also let's you flaunt your personal style when class is over. Sometimes you just don't feel like sporting an outfit that screams 'bun head' on your brunch date. We get it ... and without wanting to brag too much, versatile dancewear just so happens to be one of the things we do best. Our latest collections offer the ultimate balance of dancewear and active wear that transform into perfect street attire at the drop of a hat (well actually, with the addition of a hat)! As the saying goes, 'whoever said that money can’t buy happiness, simply didn’t know where to go shopping'. Portia wears: Energetiks Lexi Leotard in Black and Dance Track Pant in Grey Marle. Who says you have to dress up to be stylish, and dress down to be comfy? Throw the rulebook out the window with the sleek sophistication of the Lexi Leotard, paired back with our all-time favourite slouch pants: the loose and soft Dance Track Pant in grey marle. Finish with black boots (your comfiest), black shades, and a trendy cap in millennial pink (adding a splash of colour) for the perfect balance between runway-ready and low-key aesthetics. Portia wears: Energetiks Maya Leotard in black, and black Track Pants. If it wasn't a fashion crime to wear the one outfit day in, day out, this little number would be our repeat offence. It's the winning combo of the edgy yet elegant Maya Leotard (with an enchanting teardrop back, sweetheart neckline, and striking full sleeved mesh to finish), played off against our lightweight, straight legged track pants, with their leg-splicing white stripes and ankle zips, that compliment runners just as well as they do heels. Elevate the look with a body chain (in silver) and statement red lips to make that afternoon to evening transformation complete. Portia wears: Energetiks Ivy Crop in Florise, Eve Crop in Black and Stella Legging in black. You don't need us to tell you that activewear is a whole fashion movement of it's own right now, and we're obviously stoked about it. Gone are the days when wearing leggings in public was a social faux-pas, making it ever easier for dancers to camouflage training attire as an everyday fashion statement. Don't confuse everyday for boring though! Maximise on the print trend whilst still sporting classic black with this layered combo from Florise: the Ivy Crop in full print features under the classic Eve Crop in Black with the mesh-panelled black Stella Legging for an outfit that's all about the details. 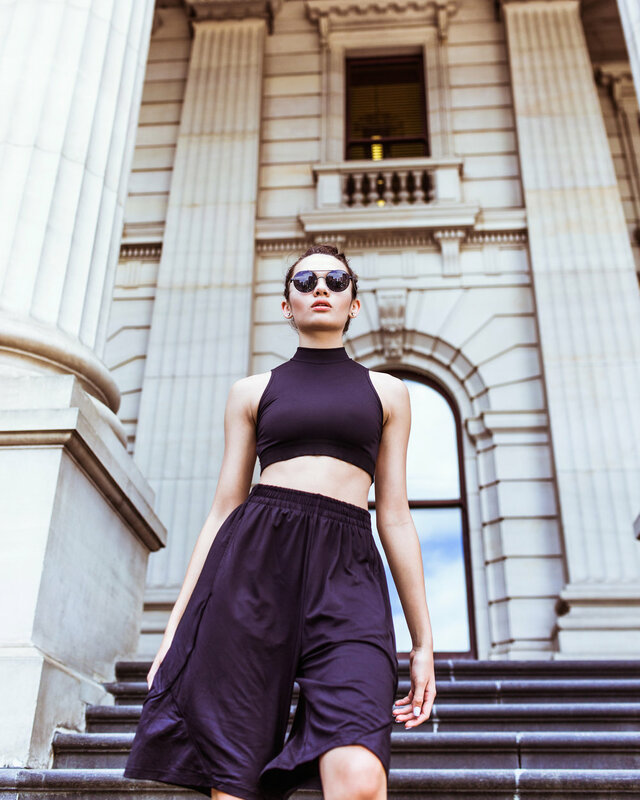 Portia wears: Energetiks Urban Shorts and Ivy Crop in black. There's no need to over-complicate things when the simplest outfits often look best. Consider this the 'little black dress' of the dancers wardrobe. Feel deliciously unrestricted in the freedom of our elastic-waisted, silky-smooth Urban Shorts, with their loose fitting leg and piped detailing ensuring ease of movement and style. Team them up with the high-necked Ivy Crop in all black, high socks and lace up black boots for a monochrome masterpiece that guarantees an instantaneous transition from in-studio to outdoors. Finally, we couldn't wrap up our favourite new looks without including a little pastel perfection, courtesy of the stunning lilac florals of Florise. If full print-on-print isn't quite your style, why not get the best of both worlds with a full-print crop trimmed in black, and full-black leggings with printed panels to complement. The supportive racer back and luxuriously soft black underbust of the Eve Crop breaks up the print whilst keeping you supported and comfy. And the full-calf panels of print on the Stella Legging allow for bold playfulness that still lets you enjoy a sleek black silhouette. Top with a pastel pink hat to play off the lilac hues, and finish with your favourite black runners. Perfection. Stay tuned for our favourite new kids and mens styling options, coming soon. Browse the full limited edition Florise collection here, and see the new Mesh Collection styles here. Dance Stories: Devon Campbell, scoliosis and her recovery from Vertebral Body Tethering surgery.